I had to count on my fingers to try to remember how many months I’ve been doing these updates now. I missed last month… so sue me, eh? Let’s back up to last March, I was sick and yet trying to keep up with the Almighty, and my entire skin care regimen. I renewed my vows to start using it daily. After 3 days of seeing my vows through, I broke the clip that holds the light. Sigh. It was all my fault too. So, I quit using the Almighty. This was a good thing in retrospect, however, since suspending the treatment (yet keeping up with the rest of my regimen) allowed me to discover what, if any, effect the LED is having. 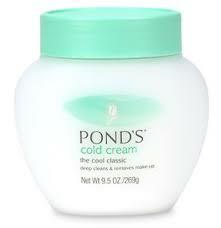 The Pond’s cold cream and facial spinning brush is wicked good. A++. So good, that when I hit the bottom of the jar, I curbed my impulse to try a new skin miracle makeup cream, and stuck with what works. My skin is dry, and I live in the desert, this stuff rocks my world. The vitamins, C-. I finished the bottle and I cannot tell you in any way, shape or form how they may have helped my skin. I would argue that vitamins aren’t going to show dramatic and immediate results, but that they are still beneficial. But I can’t share any results from taking them, because there is no noticable effect. I’m done with the special vitamins… I’ll stick to my multi-vitamin, calcium/magnesium supplement, and folic acid/omega 3. Three vitamin pills a day are enough to choke down. This dual-tube L’oreal Revitalift is still my favorite facial lotion, A+, but I’m only using it sporadically. I finally did buy some Revitalift with SPF for my daytime summer skin routine, but it has a different texture and scent than the one I’ve been using all winter. This stuff is still my favorite OTC lotion, and the only one that wouldn’t cause breakouts due to excess oil on my skin. 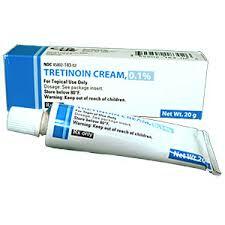 The Tretinoin (generic Retinol) night time lotion is having a modest but positive effect on diminishing my wrinkles, so I give it a B-. I’ve finally reached the point where I can use it on my face about 4-5 days a week. I take breaks in between, mostly because I forget some nights, but also due to occassional excessive dryness (in which case, I reach for the dual tube Revitalift lotion as my alternative). Water, 64 ounces daily. Um… for me most days yes, but not always. I refuse to grade water’s effect on my skin. It’s just a healthier habit to have, so I try my best, but I admit to being a black tea addict, so there ya go. Which brings our post back to where we began, the absence of the Almighty. The radiance that I saw before is gone, and I miss it. The effect on wrinkles might not have been so dramatic, but the radiance and clarity was much more pronounced when I was using it, even sporadically. I must must must find a way to use it again. Rig a new clip to the headboard, grab the duct tape and fix what I can… I dunno. But at this point, I would say the Almighty did have a positive effect on my skin, and that discontinuing usage (yet keeping up with the rest of my routine) resulted in loss of radiance and clarity. Maybe a little loss of elasticity too. New vow: fix the Almighty and go back to using it, a lot, again. And keep up with the blogging, because it really does help me stay motivated and maintain my regimen. I’ve been having a fashion epiphany, and it’s all about the ruffle. The simple, lowly ruffle. Used to be that when I thought of ruffles, I pictured flouncy, little girl dresses and a design detail that can quickly become saccharine if not handled well. But then, I had an epiphany. Truthfully, it all began with the bow, and an article I read (in Vogue? ), discussing the nature of the bow in fashion and how women are socially expected to wrap up their beauty and “present” it to the world. Fascinating! And then, I began to work on a ruffle scarf with some new yarn I had bought last month. I kept trying to force my yarn into a shawl, but the shawl pattern kept getting messed up. After ripping it apart 3 times, I figured the yarn didn’t want to be a shawl, and so instead I found a pattern for this scarf. And that’s when I began to understand the nature of the ruffle. The ruffle is a statement of excess. Of glorious, luxurious, even ludicrous excess! To create the spiral ruffle, the pattern is worked length wise. You cast on 200+ stitches, and every four rows, you basically double your stitches with “yarn-overs”. By the end of the scarf, you’ve added over 800 stitches. But, I wanted a long scarf that could be doubled up, if necessary. So I cast on about 260 stitches, and modified the pattern to the yarn I had to work with. The final rows were over 2000 stitches. 2000 stitches in one row! The very thought boggles my mind, the very excess of 2000 stitches, which take me a day or more to finish, in a single row! An entire ball of yarn, 450 yards in length, would create 3 rows. That means 150 feet of yarn create only one 1/4″ row along the length of the scarf. Overall, a half an inch was created, and for nearly $8 per ball. Historically, the ruffle comes in and out of fashion regularly, and in today’s buyer’s market no one really considers the extra fabric that was needed to create the ruffles on your skirt or shirt sleeves. The ruffle’s true nature of glorious excess has been lost on bargain racks of clearance items. But, my darling ruffle, I understand you now… and I every time I wear my scarf (which I should finish binding off today!) I will remember how the true nature of the ruffle in fashion was revealed to me. I don’t watch Ovation frequently enough to know if this series is on regularly, but I have it set to record this week and thought to share the tip for others who might miss the current promotional week. “Behind the Label” is a series of 30-minute episodes focusing on designers. Anna Sui, Cynthia Rowley, Monique Lhuillier, Heatherette, Diane von Furstenberg, Stuart Weitzman… that’s just a handful of the names that I’ve captured on my DVR thus far. The quality of the filming is a bit grainy, but lends an authenticity to the documentary style pieces that doesn’t bother me. And the one-on-one interviews are edited to predominant the episode’s alloted time, which really gives the viewer a sense of closeness to the subject, which I’m enjoying. It takes the show from biography to autobiography, and that always makes for an interesting twist. Grab the remote and stack them up for viewing at later convenience, a lot of the shows are on at odd hours.